Colden is a familiar name in the Town of Montgomery, but how much do we really know about the man whose vision, energy and ideas created our town? Cadwallader Colden and his family lived on the lands he acquired here, and it was here that he developed his ideas on farming, on botany and the natural sciences. To learn about this fascinating individual, join us on Sunday, September 21, at 2 PM when Dr. Seymour Schwartz will discuss his book, ‘Cadwallader Colden: A Biography’, in the Bradley Assembly Room, 3rd Floor, Walden Municipal Building. Sponsored by the Coldengham Preservation and Historical Society and the Josephine-Louise Public Library, this is a free program open to the public. 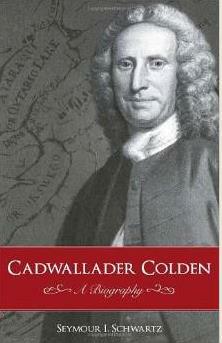 This is the first complete biography of Cadwallader Colden (1688-1776), one of the most accomplished intellectual and political figures in the American colonies before the Revolution. As the longest-serving Lieutenant Governor of New York he was intimately involved in the tumultuous political life of the times. His ‘History of the Five Indian Nations’ (1727) was the first English history of the Iroquois and a popular book both in the colonies and in Europe. Colden was also a trained physician. Though he never practiced, he significantly improved the public health of the colony. Furthermore, he was an internationally recognized botanist, the author of the first scientific paper published in the colonies, and an accomplished cartographer who published the first map in the colony of New York. A prolific letter writer, Colden corresponded with many of the major intellectuals of his day, including Benjamin Franklin and Samuel Johnson. In addition, he wrote extensively on a wide range of topics, including philosophy, history, the natural sciences, and mathematics. Why has this distinguished individual fallen into obscurity? As an ardent royalist he was the most vilified of the colonial leaders and was even burned in effigy. This well-researched and long-overdue biography tells the fascinating story of this multifaceted colonial Renaissance man. Seymour I. Schwartz, MD (Pittsford, NY), Distinguished Alumni Professor of Surgery at the University of Rochester, is a world-renowned surgeon and the author of Schwartz's Principles of Surgery, which in its seven editions and translations has sold more than 500,000 copies. He is also the author of a history of American surgery called Gifted Hands: America's Most Significant Contributions to Surgery. Dr. Schwartz is equally renowned as a cartographic historian and is the author of many books on historical maps, including Putting "America" on the Map: The Story of the Most Important Graphic Document in the History of the United States. The Coldengham Preservation and Historical Society is chartered by the New York State Education Department to raise public awareness and promote the appreciation of the history and legacy of Cadwallader Colden, Lieutenant Governor of Provincial New York. This group of local citizens and Colden descendants meets monthly at the Wallkill River School in Montgomery. Visit the website at www.coldenpreservation.org and like us on Facebook (Colden Preservation & Historical Society) to learn about our programs and membership.